What I tended to find with Neptune was if I stuck with the default settings and used applications in the normal or most straight forward fashion, then things went smoothly. But when I stepped off the straight and narrow path, things tended to unravel. Trying Enlightenment or Wayland sessions, for example, did not work well, but things went smoothly while using Plasma's X session. Checking for updates as soon as I logged in resulted in no packages being found, but if I waited for things to settle in the background and gave the operating system a few minutes, I'd eventually be told updates were available and could install them with a few clicks. There are a few rough edges here and there, but on the whole Neptune worked well. The stable Debian base combined with the latest version of Plasma, Chromium and LibreOffice were a good mixture. It gives us a solid base with lots of new features and I think that's a good combination, especially for me. There are some edge cases where I ran into minor problems and I didn't like that the settings panel didn't warn me before discarding changes, but otherwise I had a good week with Neptune. I think it's a good fit for relative newcomers to Linux and people looking for a balance between reliability and fresh desktop software. Kodi media player is a boon for cord cutters. In an era where subscription-based streaming services are popping left and right, Kodi presents an easy method to watch movies free online. By installing some of the best Kodi addons and top Kodi repositories, you can access hundreds of millions of movies and TV shows. Due to the awesome work by long-time developer waddlesplash, nightly images after hrev53079 have read/write NVMe support built-in. What is NVMe? For those not keeping up with the latest advances in tech, NVMe is a M.2 form-factor flash-based storage device which attaches directly to the system’s PCI Express bus. These flash devices are present in modern desktops and laptops and offer transfer speeds of several GiB/s. These devices now show up in /dev/disk/nvme/ and are fully useable by Haiku. Back during the BeOS days of the 90's, NVM Express solid-state storage obviously wasn't a thing but the open-source Haiku OS inspired by it now has an NVMe driver. 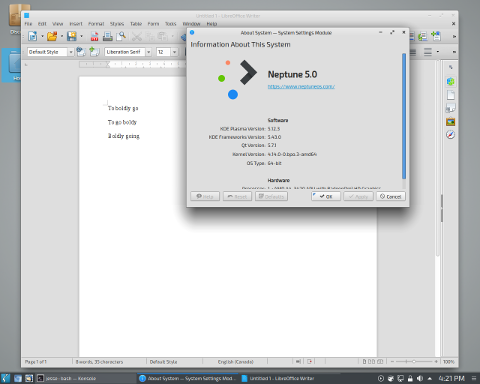 Haiku that aims to be an open-source OS based off BeOS now has support for NVMe SSDs. This driver didn't make last September's Haiku R1 beta but now being found within the latest development code is for NVMe SSD hardware. OSI Board Directors have broad backgrounds and experience, working in a variety of roles—Chief Open Source Officer, Chief Information Office, Chief Technology Officer, Open Source Program Manager, Community Manager, Developer, Architect, Engineer, Attorney—for both corporations and communities—Clojure Community, Cloud Native Computing Foundation, Debian Project, Free Software Foundation, Github, Google, Kubernetes Community, Microsoft, One Laptop Per Child, Open edX, Oracle, Python Software Foundation, Red Hat, Salesforce, Sun Microsystems , The Document Foundation, Wikimedia, Zalando... and many, many, more. The deadline to ship localization updates in Firefox 67 is quickly approaching (April 30). Firefox 68 is going to be an ESR version, so it’s particularly important to ship the best localization possible. The deadline for that will be June 25. Why Companies Open Source Their Software? When a company releases its code as open source and contribute it to foundations like CNCF, it literally loses control over the project. What benefit is there in doing so? Why would you want to lose control over the very project you created? Dan Lahl of SAP has an answer: that’s the beauty of Open Source. I’ll probably go through another iteration of tweaking before final integration, but afaik this is the smallest, lowest power open-source avalanche noise generator to date (slightly smaller than this one). Image editors are ten-a-penny nowadays, so anything which wants attention from a divided audience needs to offer something quite special. X-Gimp is the portable version of GIMP (or the GNU Image Manipulation Program), which is one of the most powerful free image editors available and is frequently described as being a free alternative to the likes of Photoshop. This is a highly versatile tool which can be used as a basic drawing program but can also be employed to edit digital photographs to a professional level. Despite being free of charge, opting to use GIMP does not mean having to compromise on features. Layers, masks, channels, filters and special effects, in addition to the usual range of editing tools, are all on hand to make image editing as easy as possible. Powerful tools such as the correction mode which allows for the correction of barrel distortion and perspective problems are usually only found in expensive packages but are included here for anyone to try out. Whether you are an amateur digital photographer or a professional graphic artist, GIMP has something to offer you. COPR is a collection of personal repositories for software that isn’t carried in Fedora. Some software doesn’t conform to standards that allow easy packaging. Or it may not meet other Fedora standards, despite being free and open source. COPR can offer these projects outside the Fedora set of packages. Software in COPR isn’t supported by Fedora infrastructure or signed by the project. However, it can be a neat way to try new or experimental software. Here’s a set of new and interesting projects in COPR. Over the past few months I’ve covered scores of open source graphical music players. They’ve been a mixed bag. Some are genuinely excellent, others falling short of my (fairly) modest requirements. The music players I’ve mostly reviewed include ncmpy, ncmpc, and Cantata. I’ve also reviewed Nulloy, Museeks, Pragha Music Player, Yarock, qoob, aux.app, MellowPlayer, Kaku, Strawberry, Headset, Qmmp, and the truly sublime musikcube. The vast majority of the music players are GUI software. Continuing my series, here’s a further graphical music player. Bearing the moniker Tauon Music Box (Tauon), it’s based around disposable playlists and the assumption that folders are albums. They are also intended to function as a kind of workspace or to keep different music collections separate. The project instructs users to ensure they have an organized and structured music library, ideally with each album in its own folder. Sound advice. The software is written in the Python programming language. It uses Advanced Linux Sound Architecture (ALSA), not PulseAudio.